Jamuna Bank Limited is a banking company registered under the companies Act 1994 with its Head office at Chini Shilpa Bhaban (2nd floor, 3rd floor & 8th floor), 3, Dilkusha, C/A, Dhaka-1000.The bank started its operation from 3rd June 2001. Jamuna Bank Limited is a highly capitalized new generation Bank started its operation with an Authorized Capital of TK.1600.00 million which is amended by TK. 4000.00 million ,as of December 2007 Paid-up Capital of the bank raised to TK 1313.27 million. JBL undertakes all types of banking transactions to support the development of trade and commerce of the country. JBL’s services are also available for the entrepreneurs to set up new ventures and BMRE of industrial units. The Bank gives special emphasis on Export Import, Trade Finance, SME Finance, Retail Credit and Finance to Woman Entrepreneurs. To provide clientele services in respect of international Trade it has established wide correspondent banking relationship with local and foreign banks covering major trade and financial centers at home and abroad. Jamuna Bank Ltd., the only Bengali named new generation private commercial was established by a group of winning local entrepreneurs conceiving an idea of creating a model banking institution with different outlook to other the valued customers, a comprehensive range of financial services and innovative products for sustainable mutual growth and prosperity. The sponsors are reputed personalities in the field of trade, commerce and industries. The Bank is being managed and operated by a group of highly educated and professional team with diversified experience in finance and banking. The scenario of banking business is changing environment. Jamuna Bank Ltd. Has already achieved tremendous progress within only two years. The Bank has already ranked the top out as a quality service provider & is known for its reputation. Jamuna Bank Ltd. Offers different types of Corporate and Personal Banking services involving all segments of the society within the purview of rules and regulations laid down by the Central Bank and other regulatory authorities. Organizations are open system that needs careful management.Jamuna Bank discreetly pursues the principles of openness, disclosure and compliance to regulatory authorities, transparency in performance, integrity in dealings, ethics in banking and accountability to the shareholders in corporate governance.Jamuna Bank is pledge-bound to keep it free from the clutches of loan default culture. All our units are the centers of excellence. Our underlying commitment to professionalism and a single-minded devotion to service to our customers characterizes our style in all operations. We involve with the changing needs of our customers and the processes go on. The Bank ensures orderly relations between clearly defined functions of the Board of Directors and the management. Their role remains sharply bifurcated .The Board formulates policies and frames procedures. Be management implements them and acts within norms. The management enjoys full independence in managing the banking industry, especially its credit portfolio without any undue influence from outside. It, however, functions in a reutilized, efficient, suitable and dynamic way to foster progress, promote general welfare of the society and infuse its people to serve the nation. In corporate governance, we strictly comply with the requirement of companies Act-1994, Bank Companies Act 1991, rules and regulation of Bangladesh Bank and other regulatory authorities. Employees of JBL share certain common values. This helps to create a JBL Culture. A sense of professional ethics. Currently the Jamuna Bank has 41 (Forty One): 16 in Dhaka,2 in Gazipur,8 in Chittagong, 3 in Sylhet, 2 in Naogaon, 1 in Munshiganj, 1 in Naryangonj, 1 in Bogra, 1 in Dinajpur, 1 Rajshahi,1 in Basurhat,1 in Noakhali,1 shirajgonj,1 in kushtia,1 in Comilla,and 1 in Laksham (including 12 rural and 2 Islamic Banking Branches).More branches and service center will be opened at commercially important locations during the year 2009. To become a leading banking institution and to play a pivotal role in the development of the country. To stand out as a pioneer banking institution in Bangladesh. The Bank is committed to satisfying diverse needs of its customers through an array of products at a competitive price by using appropriate technology and providing timely service so that a sustainable growth, reasonable return and contribution to the development of the country can be ensured with a motivated and professional work-force. Attract and retain quality human resource, High standard business ethics. Of the Bank : Profit Maximization and Sustained Growth. Of the Customer : Maximum Benefit and Satisfaction. Of the Society : Maximization of Welfare. JBL is managed by highly professional people. The present Managing Director of the bank is a forward –looking senior banker having decades of experience and multi discipline knowledge to his credit both at home and abroad. He is supported by an educated and skilled professional team with diversified experience in fiancé and banking. The Management of the bank constantly focuses on the understanding and anticipating customers’ needs and offer solution thereof.Jamuna Bank Limited has already achieved tremendous progress within a short period of its operation. The bank is already ranked as one of the quality service providers & known for its reputation. The Sponsors of Jamuna bank limited are highly successful leading entrepreneurs of the country having stakes in different segments of the national economy. They are eminent industries & businessmen having wide business reputation both at home & abroad. Out-bank will extend fully automated set-vices with quickness and accuracy. We shall use latest banking technology to reinforce internal control, improve the accuracy of records maintained, to facilitate introduction of new products and services, to reduce cost and increase productivity, Bank starts Computerized banking operations from day one. There is plan for on-line banking set-vice. Jamuna Bank Limited has a conviction of maintaining a strong capital base in carrying on operation. It started operation on June 03, 2001 with a paid-up capital of Tk.390.00 million divided into 3.90 million ordinary shares of Tk.100 each. The authorized capital of the Bank was Tk. 1600.00 million and in 2007 it increased and stood at Tk. 4000.00 million divided into 40 million ordinary shares of Tk.100.00 each. The Bank’s paid-up capital as at 31st December 2008 stood at Tk. 1313.27 million,Tk.429.00 million was raised through initial public issue of 4.29 million ordinary shares of Tk. 100.00 each with a premium of Tk. 20.00 each while Tk. 214.50 million was raised by issue of Bonus Share for every 4 share s in the ratio of 1:4,i.e.one bonus share, on the holding of 8.58 million ordinary shares as on 31.12.2005,one Bonus share for every 4 shares out of profits up-to the year 2005 and Tk.153.21 million was raised by issue of Bonus shares in the ratio of 1:7 in the year 2006.In the year 2007 Tk.87.56 million was raised by issue of Bonus share in the ratio of 1:4.Thus , as on 31st December 2008,the total shareholders’ equity and reserve stood at Tk.2160.73 million and total bank’s capital stood at Tk. 2444.34 million. Capital structure of JBL has changed from year to year. The components of the capital structure are paid-up capital; proposed issue of dividend, share premium, statutory reserve, proposed cash dividend, retained earnings and other reserve. From the above it reveals that Jamuna Bank Limited was able to increase its core capital from Tk. 1651.58 million to Tk. 2131.02 million and supplementary capital from Tk. 221.14 million to Tk.313.32 million and total capital from Tk. 1872.72 million to Tk.2444.34 million. 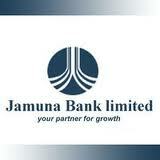 In 2008 Jamuna Bank Limited posted an operating profit of Tk. 1040.20 million as against Tk. 824.21 million in 2007 with a spectacular growth of 26.21 percent over the preceding year. After having made necessary provisions for loans and advances Tk.174.39 million in accordance with instructions of Bangladesh Bank Net Income before Tax (NIBT) stood at Tk 865.82 million in the year under review against Tk. 405.04 million in the preceding year. An amount of Tk.382.05 million has been kept as provision for payment of Tax. Thus Net Income after tax and provision stood at Tk. 479.44 million in 2008 which was Tk. 89.11 million in 2007. Jamuna Bank Limited offers different types of Corporate and Personal Banking services involving all segments of the society within the purview of the rules and regulations as laid down by the Central Bank and other Regulatory Authorities. Foreign Currency Account according to his necessity and convenience. Major information’s are essential for identification of the account holders individually so that banker can discharge his obligations to every one correctly and to the extent due. Following are the customer must complete the formalities. Deposit is the lifeblood of a bank. From the history and origin of the banking system we know that deposit collection is the main function of a bank. Banks, as a financial institution, accept surplus money from the people as deposit and give them opportunity to withdraw the same by cheque, etc. But among the banking activities, cash department play an important role. It does the main function of a commercial bank i.e. receiving the deposit and paying the cash on demand. As this department deals directly with the customers, the reputation of the bank depends much on it. The amount of Cheque, Pay Order (P.O), and Demand Draft (D.D.) Collection of amount of other banks on behalf of its customer is a basic function of a Clearing Department. Bangladesh Bank (Central Bank of Bangladesh) and operational procedures of the Bank. perception towards our performance in meeting those requirements. ability to extend better services to customers. that customer needs can be responsibly addressed. plans, policies, practices and procedures to all employees in a timely fashion. To diversify portfolio both in the retail and wholesale market. To increase direct contact with customers in order to cultivate a closer relationship between the Bank and its customers. Customers can withdraw and deposit money from all branches located throughout the Country. Our valued customers can also enjoy 24 hours banking service through ATM card from any of Q-cash ATMs located at different location throughout the Country. All the existing customers of Jamuna Bank Limited will enjoy this service by default. JBL shall allocate corporate resources to areas having the greatest growth opportunities and national interest. Full duplex Online Banking system. By modernizing the Training Institute. Expansion of business network at home and abroad. Innovation and introduction of new liability/asset products. Internet Banking, ME & Retail lending.